When it comes to prioritizing your health, sleep should be right up there with healthy eating and exercise. I value a good night’s sleep just as much as other the aspects of my healthy lifestyle. I feel extremely fortunate that I am able to get 8 hours of sleep every night but I do make quality sleep a priority in my life. 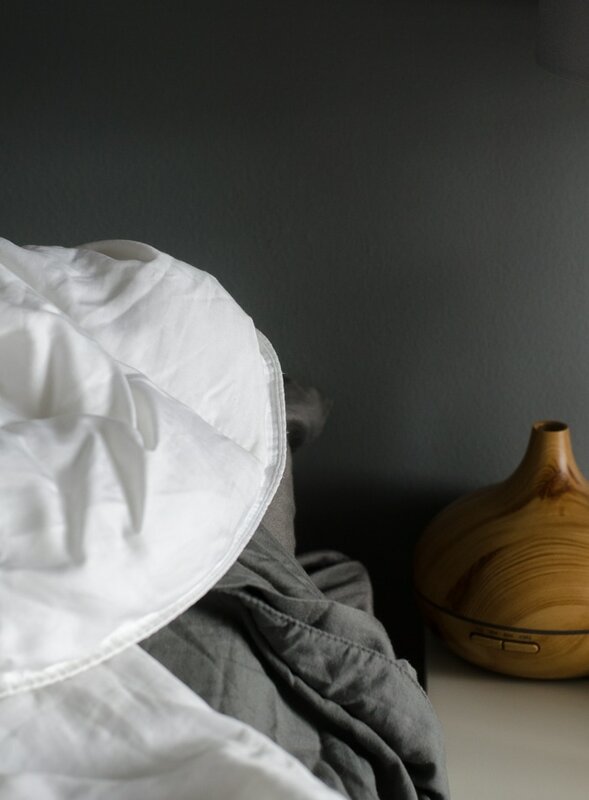 Getting good sleep is important to me and it has such a big impact on our overall health that over time, I’ve cultivated evening habits to that help promote a good sleep. Getting quality sleep is a game-changer. It plays a huge role in our overall wellbeing, health and quality of life. I wanted to share some of my favourite tips for better sleep that you can easily implement to improve both the duration and quality of sleep. These evening rituals and tips for better sleep can be used every evening to help prepare for a restful, deep sleep that lasts through the night. By using these simple sleeping tips, you’ll increase the likelihood that you’ll wake up feeling rested and ready to tackle the day. Sleep is a time for rest and recovery. During sleep, our conscious mind drifts off and our subconscious mind goes to work helping us recover, rejuvenate and prepare for another day. Developing a healthy evening routine can make the difference between restlessness and deep, quality sleep. Sleep, along with exercise, stress-management and nutrition, is one of the key factors in overall health and a lack of sleep can wreak havoc on your health. Getting enough quality sleep on a regular basis has a profound effect on our mental, emotional and physical health. The key to improving both your quality and quantity of sleep is developing an evening routine of better bedtime habits. By following some of these tips, we can tell our body it’s time to quite down and prepare for sleep, greatly improving your sleep quality. Sleep is vital to our survival. It as as important as food and water in keeping us alive and healthy. The moment we slip off into unconsciousness, the body gets to work, taking advantage of this nightly rest. As we drift off, the body starts to undergo repair and detoxification. When we sleep, our bodies move from a catabolic state to a anabolic one, meaning energy conservation, repair and growth start to take over from the energy resources we spent during the day. The body starts to produce human growth hormone, which promotes the maintenance, growth and repair of muscles and bones. The immune system gets to work increasing the production of disease-fighting hormones, helping our bodies be ready to defend itself against infection and diseases. While we soundly sleep at night, even the skin gets to work repairing damage caused by the environment during the day. Deep sleep truly is your beauty sleep and time for a total mind and body rejuvenation. Not getting enough sleep has been linked to weight gain, increased risk of obesity, depression, increased risk of disease, increased risk of diabetes and reduced immune response. Poor sleep habits also affect our skin and those regularly lacking sleep will develop more fine lines, wrinkles and pigmentation than those that rest well, libido is reduced, memory is effected and overall quality of day to day life is reduced. A loss of sleep hinders our performance in every corner of our lives, creativity, productivity and decision-making are all compromised when we skimp on sleep. If you’re an athlete or highly active, a lack of deep sleep can slow muscle growth, make it difficult to reduce body fat, impeded recovery and a lack of energy will make it difficult to perform at your best. Lack of sleep is also detrimental to brain health and can leave you feeling foggy, sluggish and again, not able to perform to your potential. Immunity is compromised and we’re more likely to get sick more often and take longer to recover. Consistently depriving the body of quality sleep comes with a huge host of health issues that only compound over time. It’s pretty clear, you know how alert, well-rested and energetic you feel after a good nights’ sleep and you know how it feels to be constantly fatigued and lacking in energy and focus. Sleep is vital to the quality of our lives. I feel best when I sleep 7 or 8 hours per night but the best way to tell if you’re getting enough sleep is simple: how do you feel during the day? Are you tired? Do you have plenty of energy to move, think clearly and have a positive outlook? If you feel lethargic and worn out, chances are you need more sleep. It’s suggested that for optimum health and mind-body function, we need about to seven to eight hours of sleep daily. This will vary individually but it most likely falls within those hours. Unfortunately, you can’t just lie in bed for 7 hours though. To truly rest and recover and take full advantage of the bodies ability to repair itself during sleep, it’s imperative we’re getting quality, deep sleep. That’s where the good stuff happens. These simple tips for better sleep can easily be implemented into your evenings to help prepare for that wonderfully, deep sleep that leaves you feeling like million bucks. Try picking just one or two to start and building upon that as you develop your own evening routine for better sleeep. 1. Control your exposure to light. Most nights, I turn off all screens about an hour before bed. Occasionally, when I work on my computer closer to bed time, I use F.LUX to control the amount of blue light I’m exposed to and I always use built-in blue light filter on my phone. Flux is a free program that alters the colour of your computer screen for healthier sleep rhythms. You can set it to your own wake up and sleep times so it starts soft in the morning and becomes less blue as the day goes on. Turn off electronics, turn off the TV and take some time to relax. For me, that means reading, journalling, meditating and usually some stretching or yoga. I go to bed pretty early, so in the Summer months, that even means closing the blinds and getting calm, cool and cozy as I prepare for a good nights sleep. Having a black-as-night sleep environment changes everything. We live in the city and get quite a bit of light coming in our windows at night. I don’t have black out curtains or blinds but I do use a sleep mask. I have this sleep mask and it works great. It’s comfortable, keeps it completely black and has really made a big different in my ability to stay asleep all night. It usually comes off at some point during the night be it really helps me fall asleep quickly and stay asleep util it’s completely dark out. I don’t mind it being off in the morning since I’m usually up before or with the sun anyways. 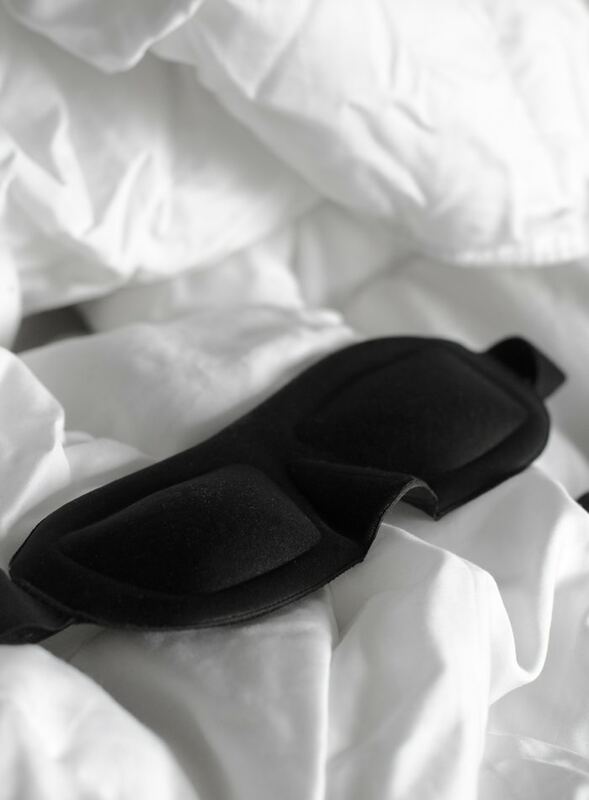 Having a dark sleep environment helps the body maintain it’s natural sleep-wake cycles so whether you use black-out curtains or a sleep mask, do what you need to do get your bedroom as dark as possible. Don’t forget the small lights emitted by alarm clocks, computers and other electronic devices as the blue light they can also effect our biorhythms. 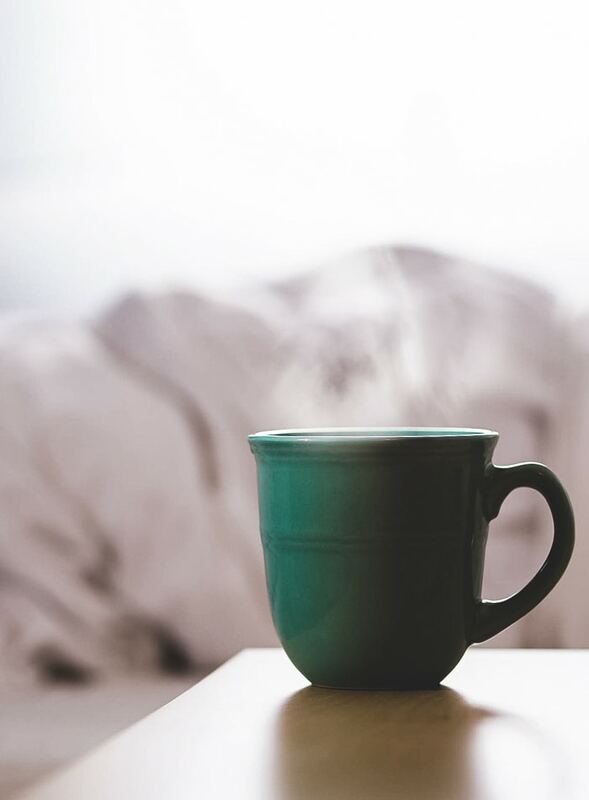 Nighty Night Valerian Tea – Known for it’s relaxation and sedative effects, sometimes combined with chamomile, increases the amount of GABA in the brain which helps to calm nerve cells. Four Sigmatic Sleep Supplement Drink Mix – Amazing product from an amazing company, use “RUNNINGONREALFOOD” for 10% off your order. Natural Calm Magnesium Supplement – Magnesium is well-known for its ability to naturally relieve insomnia. Studies have shown it helps to decrease cortisol, helping you to sleep at night, as well as help muscle relax and give you an overall feeling of calmness that can help you unwind in the evening. 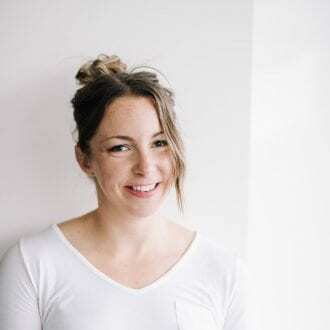 Magnesium deficiency is actually quite common, so supplementing with magnesium in the evenings may help you sleep better if you’re not getting enough in your diet. Melatonin – A hormone that regulates the wake and sleep cycles and other biorhythms, you can use it occasionally before bed, making sure your bedroom is completely dark when you use it. Calcium – Adequate calcium in the daily diet is also important in helping us relax and get a good nights sleep, if your diet is lacking in calcium, focus on eating calcium-rich foods and if you’re still not getting enough, you may want to think about using a calcium supplement. Vitamin C – Important in regenerating tissues and sleep, start with eating vitamin C rich foods and if needed add a vitamin C supplement if needed. Adaptogens are substances that help he body adapt to stress and a less stressful mind and body allows for better and more rejuvenating sleep. Adaptogenic herbs can help regulate important hormones such as cortisol which in turn allows us to fall asleep faster and stay asleep throughout the night. They can be taken as powders, blended with tea, coffee or smoothies or taken as a tea or in pill form. Holy Basil – helps to lower elevated cortisol and regulate blood sugar. You can also try my relaxing evening reishi elixir drink. Adaptogens do carry more of a cost than natural sleep aids like valerian tea however they last a very long time and have a range of health benefits outside of helping us sleep. Chamomile tea and lavender can also be relaxing before bed. Some people use a 5-HTP supplement to increase serotonin in the brain as one of the functions of serotonin is to regular sleep. 5-HTP, which is produced by the body from the amino acid tryptophan, can be effective in promoting a natural calm mood and improving symptoms of depression. I don’t have much experience with it but it’s worth looking into if you’re struggling with sleep. GABA is another one that’s used to promote a calming effect and relieve the anxiety that can keep you up at night. It’s not something I use but it’s another option that may help you fall asleep faster. 4. Improve your sleep environment. My favourite part of my evening routine is turning on my essential oil diffuser and salt lamp to create a calming sleep environment. I actually have a diffuser going most of the time but in the evenings I like to use essential oils like lavender, ylang ylang, neroli, orange, begamont, rose and frankincense. 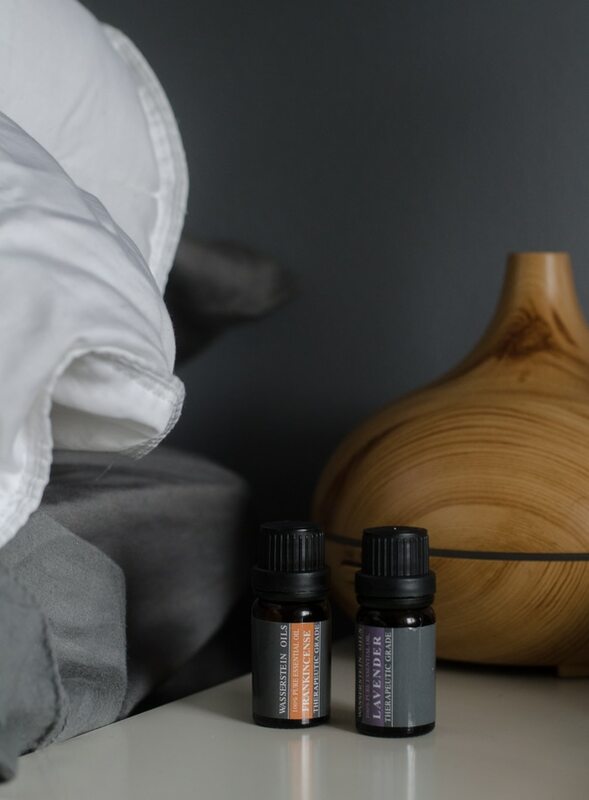 There are many essential oils that can help with relaxation and promote sleep. My favourite way to use them in in a diffuser but on occasion I’ll sprinkle a bit of lavender on my pillow or dot it around some pressure points on the body. You can also add them to a warm bath, mix them with coconut oil for a bedtime moisturizer or use diluted oils topically on areas like your upper lip, temples and wrists. We spend roughly a third of life sleeping, so you can imagine how big of an impact has on our overall health. For this reason, I believe investing in natural bedding that feels good to be quite important. 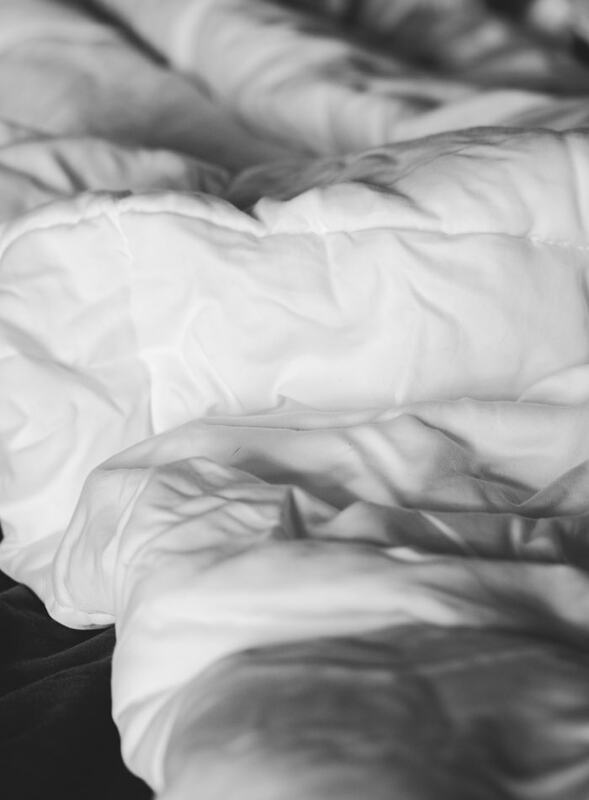 Sleeping in bedding you love is another simple way to improve your sleep environment. 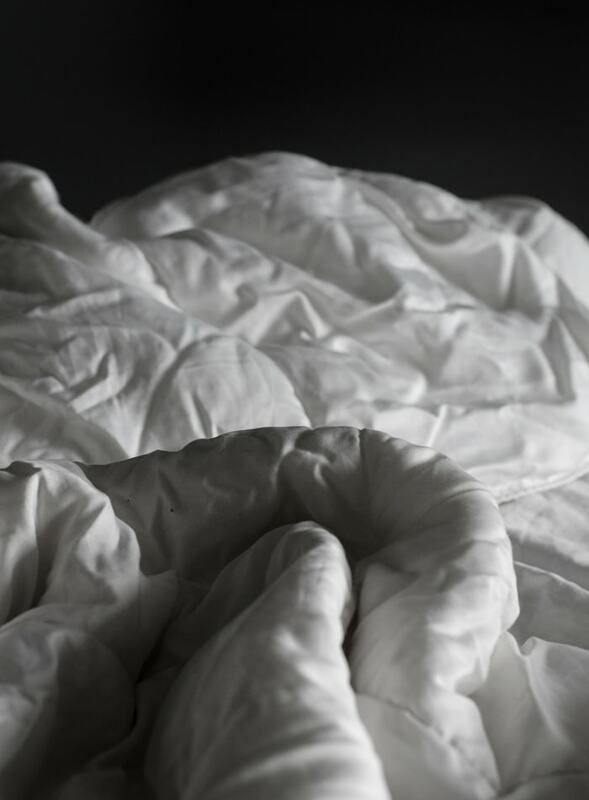 As for a comforter, I was recently sent The Charm by CHARM Sleep and I absolutely love it. It has the softest fabric and is full of fluffy, lightweight, silk-soft eucalyptus fibers and ultra-light microfiber that lasts longer and work better than down. It’s also 100% cruelty-free. It’s super breathable too which I love because I tend to get hot at night. CHARM Sleep has offered Running on Real Food readers $25 plus free shipping. I highly recommend it and if you want to try one one, they have a 100 day risk free trial so you can’t really go wrong. Click here and use the code: RUNNINGONREALFOOD to purchase. Poor air quality may increase the risk of sleep disorders such as sleep apnea and effect your ability to stay asleep throughout the night. 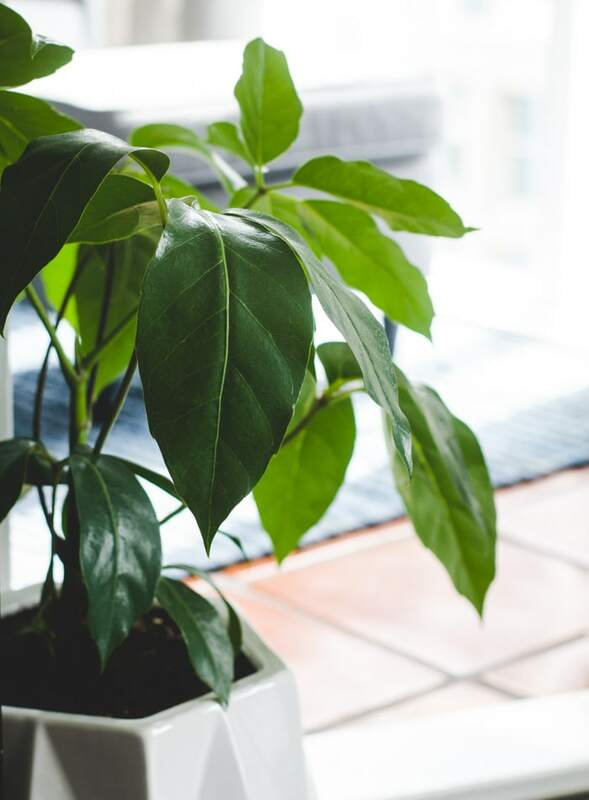 There a couple of options you can use to improve air quality in your home. Personally, I just have a ton of plants to help clean the air. I love the way having a home full of beautiful greenery makes me feel me too. You can also use an air purifier, I don’t have one but I could probably use one since I have two dogs in the house. Air purifiers can help remove dander, allergens, mold and smoke but I can’t say much from experience since I’ve never used one in my home. 5. Keep your bedroom cool. My home is pretty warm during the summer months and the best I can do is use a couple of fans in the bedroom to stay cool. A cool environment is important for optimal sleep. As the body temperature falls during the night, melatonin is release to encourage feelings of sleepiness. Light and temperature effect the secretion of melatonin and because it helps control sleep-wake cycles, so it’s very important to keep your bedroom cool and dark for optimal sleep. Low body temperature can improve your ability to sleep deeply allowing the body to rest and repair and staying cool throughout the night can help you stay asleep. I really love my CHARM Comforter for staying warm even though I keep the room cool. I can leave the windows open so as the night goes on, the temperature in the bedroom drops and I can sleep well. 5. Don’t eat too heavy right before bedtime. You don’t want your body focused on digesting while you’re trying to sleep. If you have to eat close to bedtime, keep it light and easily digestible. 6. Don’t go to bed hungry. Just like going to bed with too much food in your stomach isn’t idea, you also don’t want to go to bed starving either. I try to eat my dinner at least a couple hours before bedtime to allow time to digest but not so long that I’m not getting hungry again. If you’re are hungry before bed, try having an easily digestible snack like dairy-free yogurt with some berries, a protein shake, carrots and hummus or half a banana or apple with a bit of almond butter. You want just enough to tide you over but not so much that your body has to send valuable resources to your digestive system all night. Hopefully, your dinner was satiating enough that you don’t get hungry again before bed. At dinner time, try to focus on creating balanced meals that contain all 3 macronutrients: carbs, protein and fat. By including protein and fats with the carbs, it can help to slow down digestion and prevent a spike and subsequent crash in blood sugar that may leave you hungry shortly after. Moving during the day can help you fall asleep faster so you can wake up feeling rested and ready to hit it again. Exercise can dramatically improve the quality of sleep, especially when done on a regular basis. Exercise help to reduce stress and tires you out, the perfect combo for quality, deep sleep. You may need to experiment with exercise at different times during the day to see what works best for you. If I have a hard workout too close to bed time, I’m too wired to easily fall asleep. I love working out early in the morning and if not, at least a few hours before bed time so I have time to wind down again. It depends on the individual though, you may find tough workout close to bed is just what you need to pass out as soon as soon as your head hits the pillow. In Sleep Smarter by Shawn Stevenson, he recommends at least some exercise in the morning, even if you still plan to workout later the day. In a study by Appalachian State University, it was found that morning exercisers spent more time in the deepest, most anabolic stages of sleep, slept longer, had more efficient sleep cycles and had a greater drop in blood pressure in the evening. If you’re short on time in the mornings, by spending just 4 minutes doing something like a Tabata workout you can still enjoy the benefits of morning exercise. Again, sleep and exercise go hand in hand. If you’re lacking sleep, you may skip your workout or be lacking the energy for a good workout, which in turn, affects sleep the next day and so on, and so on. Lack of quality sleep can also effect your ability to recovery from intense exercise and build new muscle. It’s all related. Exercise and get enough sleep everyday to get the most out of both of these aspects of overall health. 8. Eat well during the day. A healthy, balanced diet that promotes stable blood sugar is one of the pillars of health. A healthy diet will help you manage stress levels, have the energy to exercise, promote healthy digestion, improve circulation and mental health and more. Again, all of these pillars of health are important in promoting good sleep. Blood sugar imbalances, which are often caused by the overconsumption of sugar, refined carbohydrates and stimulants, can perpetuate restlessness and other sleep issues, so maintaining stable blood sugar levels throughout the day is important. It can also help to decrease your consumption of common allergens such as gluten. It’s also been found that there’s melatonin in the gut so it’s important to naturally support the gut micro-biome to help optimize sleep and avoid things that destroy the micro-biome. This would include things like unnecessary antibiotics, chlorinated water and heavily processed foods. Some other ways to improve sleep through your diet are to eat foods rich in magnesium such as dark leafy greens, nuts and seeds, choosing complex carbohydrates over processed foods and including enough high-quality fats in your diet. Vitamin C is also important for sleep, so including vitamin C rich foods can also help. A well-balanced diet is also important for supporting hormones which, if out of whack, can also cause effect sleep. 9. Don’t drink too much water before bed. It’s important to stay hydrated throughout the day so you don’t find yourself chugging water right before bed and having to get up to pee all night. I drink a lot of water throughout the day, starting with a big glass as soon as I get up, and then cutting out the liquids too close to bed time. There’s nothing worse than having to climb out of your cozy bed multiple times throughout the night to stumble to the bathroom. Once you’re in that deep sleep zone, it’s important to stay there. When were stressed, our minds race with thoughts instead of starting to calm down and prepare to sleep. Stress can really steal away our precious time to each night and it also effects the quality of that sleep. When we fall asleep, the body switches from the the active sympathetic nervous system over to the more chill parasympathetic nervous system. Stress can effect this process, keep our brains hyperactive and leaving up wide awake. Stress is inevitable in our lives and that’s fine but it’s important to take steps to manage stress on a daily basis so its doesn’t build up. Many of the other tips on this this list can help manage stress in the evenings. Taking time for self-care and love in the quite evenings hours, is a good way to bring those stress levels down. A cup of tea, a good book, maybe a warm bath, meditation or laugh with your partner. Essential oils can also help calm up, which is why I like to keep my diffuser running all afternoon. Evening meditation or journalling can help clear and calm a racing mind so you don’t end up laying in bed with your thoughts going haywire. Not managing stress can create a cycle of poor sleep. You’re stressed so you can’t sleep, then that lack of sleep causes more stress and so on and so on. You have to look at all of these from a point of total wellness because it’s all inextricable connected. Sleep, exercise, stress management and the food we eat are all connected. Take care of those four pillars of health and you’ll be well on your way to feeling great day in and day out. 11. Avoid caffeine late in the day. If you’re ever had caffeine too close to bed time you know how frustrating it can be trying to fall sleep. You’re exhausted but you’re all hopped up on caffeine so you lay in bed tossing and turning with a racing mind, kicking yourself for that late after noon coffee. I usually only have one coffee in the early morning, if I do have a second cup, I try to have it before 2 pm at the very latest. the same goes for caffeine tea like matcha or chai. If you need a boost in energy in the late afternoon, try going for a quick walk or getting some other exercise in, stretching, do some deep breathing, take a short nap or simply making sure you’re well hydrated. The bedroom should be a calming and cozy environment that you enjoy being in. 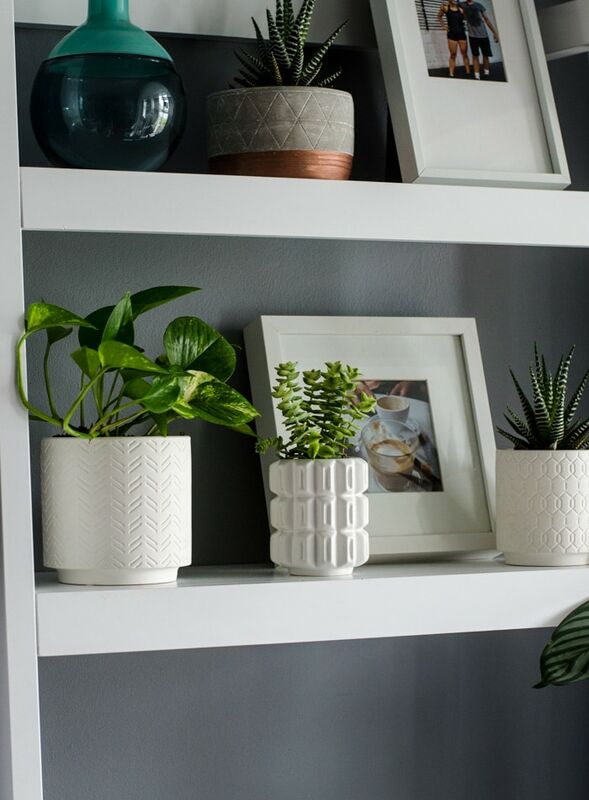 For me that means it’s clutter-free and decorated minimally with neutral colours except for the fresh, green beauty plants add. I like to keep a few of my favourite photos on display, a couple pieces of art I like, there’s no TV or electronics, it’s painted a soothing dark gray colour, my diffuser sits bedside and there’s a cozy nook for bedtime reading and writing. I try to stretch or do a bedtime yoga routine most nights. Usually this only lasts just 10 minutes but it’s a nice way to begin my evening routine. I like to stretch out my hips and back in particular which are usually the tightest from training and working. 14. Cherish your evening routine. Just like my morning routine, I’ve grown to cherish my evening routine. I love unwinding at the end of the day and spending sone time reflecting on everything that happened. If you can assign a small area in your home as a place to chill, read, write and just think, that’s a great spot to enjoy your calming evening routine. Having an evening routine will be directly reflected in the success of your mornings. If you plan ahead, you’ll wake up feeling productive and end up getting more done. An hour before bed I stop working, electronics get turned off and it’s time to get into sleep mode. Planning for the next day – If you don’t have a clear idea of what you want to accomplish, how are you going to accomplish it? I write down the top 3 tasks I want to accomplish the following day, as well as a list of small, quick tasks I can tackle if there’s time. I review my big goals and aspirations to keep them front of mind. Self-awareness is so important to our success and making time in our evening routines to plan and dream is so important to keep us moving forward. I’ve found I’m at my most productive when I plan my entire day the night before, blocking off time for tasks, eating and exercise. I might not stick to it 100% but I’m much more likely to achieve what I want if I have a clear plan laid out. Reflect on the current day – What worked? what didn’t? What can I do better the next day? What am I grateful for? Oral hygiene – brush, floss, you know the drill. Meditation – A lot of people like to meditate in the morning but I like doing it write before bed. I use the Calm app and Gaia to do short, guided mediations. I find that after being go, go, go in the world all day, I need a moment to turn inwards. I almost always fall asleep during my meditation, which is why it’s so perfect for me right before bed! Reading – So you’ve turned the TV off, your phone is tucked away. Now what? Well, now is the perfect time to either treat yourself to some fiction or dig into some non-fiction. I’m a non-fiction junky so in the evenings you’ll find me reading self-development books and writing some notes as I read. Reading is so important to expand our minds, keep learning new things and improve creativity. 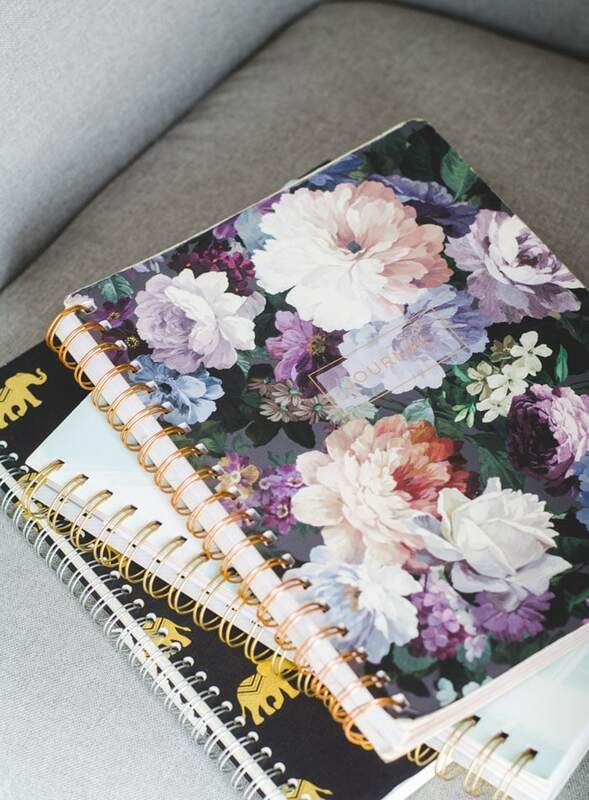 One of my favourite life tips is to never leave home without a book! 15. Stick to a sleep schedule. Sticking to a sleep schedule every day is really important. When you establish a regular sleep pattern, it allows your circadian rhythm to operate at its best. Our circadian rhythm operates as our internal biological clock and it regulates sleep cycles. It functions best when you stick to a routine. Irregular sleeping patterns can throw your circadian rhythm out of whack and come with their own host of health concerns such as weight gain, cholesterol levels and a greater insulin response. Try your best to maintain the same sleep and wake schedule every day. That means going to bed at the same time every night and avoiding the snooze button in the morning. And yes, that means weekends too. Going to bed and getting up at the same time everyday can go a long way in improving both your ability to fall asleep quickly and ability to wake up before your alarm says you have to. This one can be tricky. I live in the city and have a lot of noice coming in if we keep our windows open at night. Luckily, I find I’m a heavy enough sleeper and typically exhausted form long, busy days that it doesn’t wake me up. I find that by keeping a fan on it acts as white noise, drowning out the noises coming through the window. If you find noises are waking you up during the night, do what you need to do to get your bedroom as quite as possible. Some people like using sound machines with soothing, mellow sounds to mask random noises or even sleep with ear plugs if needed. In the morning, when it is time to get up, I like setting my alarm to slowly increase in volume so I can wake up gently. Okay, now I want to hear from you guys. Do you have an evening routine? Do you struggle with falling asleep? Any favourite tips for better sleep to share? Let’s hear it in the comments below! Thanks for sharing all these great tips! Improving sleep environment with essential oils, a fan, and the hum of an air purifier are big ones for me! Totally on the oils and fan! The hum of the fan seems to do it for me, I don’t have an air purifier but I could probably use one! Anything you recommend?? What a great article, thank you for writing this and sharing it with all of us! I will definitely be trying some of these tips. I’ve been looking for some more natural sleep aids, so I love your suggestions! This is so well done! Excellent work! Thank you, Hannah! Appreciate it! One of the best posts I have read lately, so long and informative! i’ve always had sleep problems it’s a constant struggle to maintain a good pattern. i love morning and waking up at 6am, but it seems that my brain is truly a night owl haha. i love your tip about filling your bedroom with plants, it’s great to have more reasons to buy more plants!! Hey Jenny! Thanks for your comment. I’ve always been a morning person…sometimes I wish I was a BIT more of a night owl and not going to bed at 9 everyday, haha, but since I’m up at 5 I really need that 9 pm bedtime to feel my best. 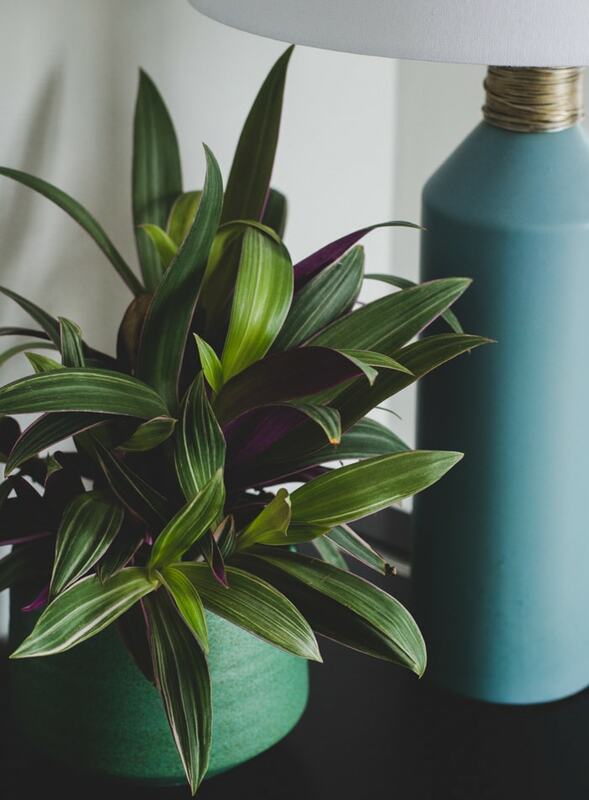 I’m obsessed with plants, haha…I love a home full of bright green against the rest of my decorating and wall colours, which is very neutral. Happy sleeping!! This was a great and thorough read. I’ve been having trouble sleeping through the night, mainly because I have 2 young kids. But also when I do sleep without interruption I still wake up tired more often than not. I do a lot of the things you suggest but I also have very intense dreams that usually leave me upset or exhausted and frustrated in the morning. Not sure how to resolve that or if it’s connected but that’s what I’m dealing with now 🙁 thanks for your thoughts on better sleep. Hoping I get to experience better sleep soon! Oh, that’s though. I don’t vividly very often or don’t remember them anyways. I wonder what’s causing that for you? 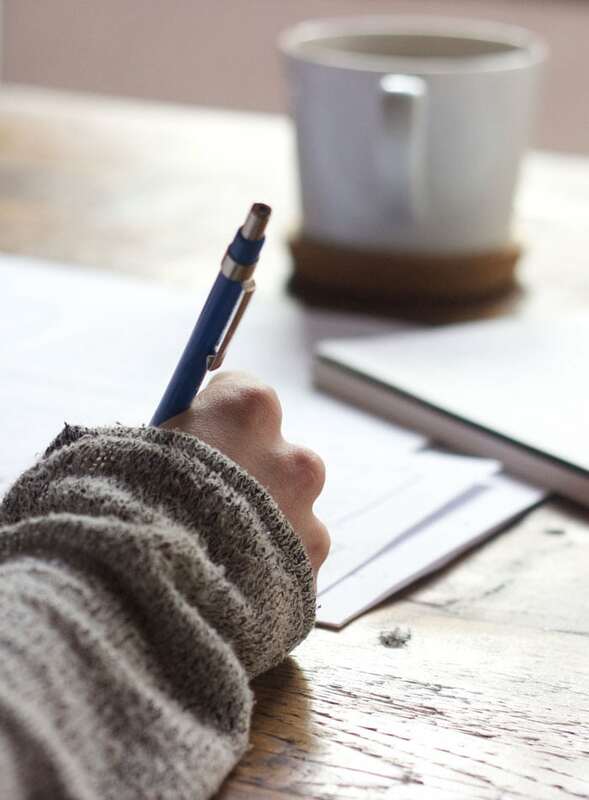 Have you tried free writing before bed for 10 minutes to help clear your mind? I don’t have young children so I definitely have more time in the evenings to calm down and prepare for a good sleep. I hope it improves for you soon to. Lots of love. I try to follow most of these, but I’ve been horrible about turning off electronics this summer. I blame it on binge watching GoT and blogging. I want to try the essential oils. I haven’t done that one yet. haha, I hear ya. My husband and I started GOT from the beginning but we only watch a couple per week and I’m pretty adamant about having at least 30 minutes of down time before going to bed. I love essential oils, I have them going all the time…it just makes my place smell so good and fresh! Thanks for your comment. I like the idea that you say “stick to a sleep schedule”. I usually turn off my e-dvice, take a warm shower and then read for about 20 minutes. I usually am able to sleep well if I stick with this schedule. But if I am out of the routine, sometimes it is harder to sleep well.